Bongbong Marcos’ spokesman, Victor Rodriguez, discloses that the Comelec already starts to decrypt and print the ballot images on the SD cards. The venue of the activity is its main office in Intramuros, Manila. This follows the orders of the Supreme Court in relation to Marcos’ election protest against VP Leni Robredo.The Comelec prioritizes the three pilot provinces for the recount. [VIDEO]: Kampo ni Bongbong Marcos, kinukwestyon ang mga datos na nakuha sa mga SD card. Robredo’s camp initially tried to postpone the scheduled decryption. They only brought two revisors, according to her lawyers. But the Comelec denied Robredo’s motion to postpone. “What are they afraid of? If they believe she won, they should be rushing to count the ballots. That way, this issue could finally be laid to rest in her favor. Instead, they have adopted a strategy of delay and obfuscation,” Rodriguez said. The activity covers precincts in the provinces of Camarines Sur, Iloilo, and Negros Oriental. Rodriguez added. The process for the three pilot areas takes at least seven months. Rodriguez also mentioned that the PET recently ordered its exploratory teams to start locating the ballot boxes. This is for the clustered precincts of Camarines Sur, Iloilo, and Negros Oriental. When they are done, it could order its retrieval and transfer to Manila. Under the Rules of PET, the three pilot provinces for the recount will best exemplify the merits or legitimacy of Marcos’ protest. Rodriguez said it was highly improbable for Robredo to get 80 percent of the votes in Camarines Sur. Other vice presidential candidates were either from the Bicol region or had ties in the said region. Robredo obtained 643,865 votes as against Marcos’ 40,195 votes in the May 2016 election. The other Bicolano candidates namely Senator Francis Escudero, who is from Sorsogon, got 36,509 votes. Foreign Affairs Secretary Alan Peter Cayetano, whose wife is from Albay, received 14,601 votes. Senator Antonio Trillanes IV got 11,334 votes. Senator Gregorio Honasan II, whose mother is from Sorsogon, garnered only 7,005 votes. Rodriguez wondered why Robredo obtained 573,729 votes as against Marcos’ 94,411 votes in Iloilo. His running mate, the late former Senator Miriam Defensor Santiago, was from Iloilo. Marcos received 99,208 votes in Negros Oriental as against Robredo’s 248,102 votes. Despite the former senator’s backing of the “biggest political families” in the province. Rodriguez added the three provinces had the highest undervotes. That raised suspicion on the results of the polls. Undervotes are ballots not counted because the voter did not vote for a certain position. Unclear markings in the ballot can also result to that. Vice President Leni Robredo as always denies destabilization allegation and calls it “baseless.” The alleged conspiracy by the “yellows” to destabilize the administration of President Du30 as Mayor Sara Du30 refers to as real as terrorism leads the President into issuing an ultimatum to initiate a “revolutionary government.” It’s the same as what the late Corazon Aquino did. This has irked the LP leader and accuses Du30 again of instilling fear among the people. There are two scenarios why this is so. One, her fellow government critic, Senator Antonio Trillanes IV goes out of his way to have a meeting with an anti-drug war counterpart in the US. The recount on the election protest that might make Bongbong Marcos the new VP soon is about to happen, secondly. [VIDEO]: Umalma si VP Robredo sa pagdawit sa Liberal Party sa umano’y destabilization plot laban sa gobyerno. Du30 said that this “revolutionary government” would be similar to what President Corazon Aquino created shortly after the People Power Revolution in February 1986. He said that the “yellows and reds,” referring to the pro-Aquino and left-wing groups, should just unite since they shared “the same ideological whatever” of wanting to “kick me out” of office. DFA Secretary, Alan Peter Cayetano said; “I worked with Senator Trillanes in the past and you know my respect to the Senate as an institution. All I can say is, although it’s a free world, it doesn’t help the country where there’s misinformation, disinformation, especially false information” “Even when I was a staunch critic of some presidents, I’ve never gone abroad to ask for help to topple them,” he said. He added that he requested a meeting with Rubio, but the Senator is still not available. Cayetano was also a VP contender and running mate of the President. However, he and his campaigners are already open to Bongbong Marcos’ possible victory against Robredo. They are convinced that Marcos as VP would stop destabilization efforts. All Filipinos always have political preference may they be in social or mainstream media. The recent proliferation of fake news Senate hearing distinguishes false information from opinions. Bloggers insist that democracy allows them to voice out their side of the story regardless of the other side. This is not the case with journalism as a profession. Analyzing the outcome, it is clear that the Du30-Marcos supporters come to terms with the tandem despite not voting for the same during the 2016 election. 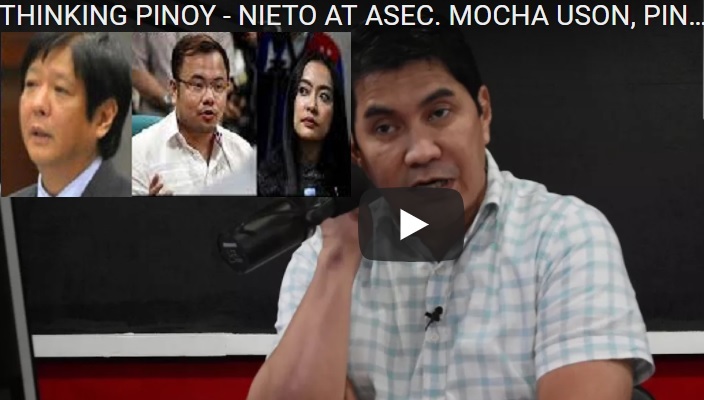 [VIDEO]: Napahanga si Erwin Tulfo kung paano hinarap ng mga bloggers ng Thinking Pinoy na si RJ Nieto at Asec. Mocha Uson ng Mocha Uson Blog ang mga tanong sa kanila kahapon sa Senado. Ang saloobin ni Erwin Tulfo, pakinggan! Erwin Tulfo is an avid supporter of President Du30. He also speaks highly of Bongbong Marcos. He praises social media practitioners TP and ASec Mocha Uson for educating the Senators who are obviously not in touch with the real world. TV Anchor Karen Davila cannot believe that her guest Atty. Trixie actually defended Mocha Uson based on her legal knowledge. She explained that there’s no difference between an elective or appointed government official when it comes to business ethics. Uson was hired by the President because of her media influence. She is just being herself. Youtube video by; MASAYA KA BA? Mocha Uson retaliates to Karen Davila’s criticism on her by saying that bloggers have the right to express and share their opinions with their followers just like mainstream media personalities. This should not change once they change or got a new job. [VIDEO]: Former senator Ferdinand “Bongbong” Marcos Jr says his family has long suffered from fake news. He also believes it is readers’ responsibility to avoid blogs and posts they think are making false claims. Bongbong Marcos’ family suffers from the fake news for more than 30 years. However, he cannot find it in his heart to feel bitter about it. He is just thankful that finally, there’s a medium that allows the voice of the majority to be heard. Senator Grace Poe is the Chair of the Fake News Senate hearing. She describes the difference between fake news, opinions and other information found both online and offline. Senator Tito Sotto admits triggering the event because of the “Silent No More” blog destroying pro-Duterte Senators that was allegedly masterminded by his LP colleagues. Senator Manny Pacquiao takes part in the discussion on how to regulate misinformation if it is possible to do so. Uson and Nieto of Thinking Pinoy actually voted for ex-Senator and now DFA Secretary Allan Peter Cayetano for VP. However, they are for the recount because it is the right thing to do. Former Senator Bongbong Marcos urges the Supreme Court to handle his electoral protest against Vice President Leni Robredo with urgency. They have to decide one way or the other how to proceed. It is of national interest to know who the real VP is. [VIDEO]: BONGBONG MARCOS NABABAGALAN NA SA PAG-USAD NG ELECTORAL PROTEST LABAN KAY LENI ROBREDO. The Supreme Court cannot decide on the recount date yet because the COMELEC’s logistics, schedule and estimated costs relative to the Decryption and Printing of Ballot Images for Camarines Sur, Iloilo, and Negros Oriental are not yet ready. Its plea for additional time to comply with the PET’s Show Cause Order was granted twice. 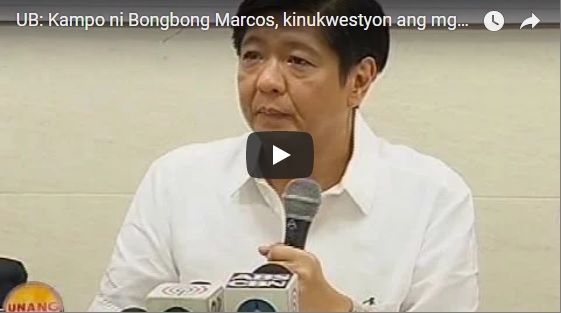 Marcos cannot tolerate its leniency towards the COMELEC anymore. 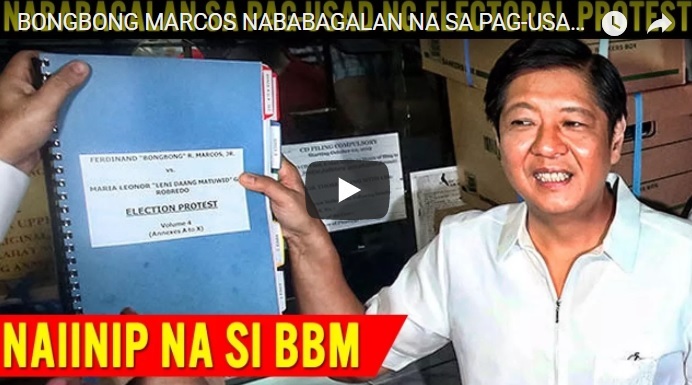 His other petitions include a ballot recount in 27 provinces, and nullification of votes in the provinces of Basilan, Lanao del Sur, and Maguindanao, where Marcos alleges the election turnout was rigged. The PET moved to partially grant a recount. However, this is limited only in the pilot provinces of Camarines Sur, Iloilo, and Negros Oriental. However, Marcos notes that the “actual order” sending teams to the provinces has not been released yet. The Supreme court also did not junk Robredo’s counter-protest even if she failed to pay the required fee.